I won't blame anyone for not knowing who this man is. 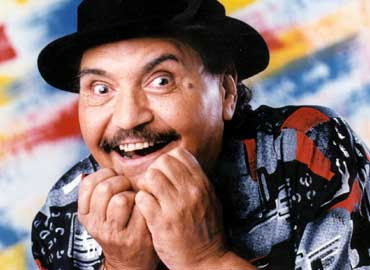 For me, however, I can say that on learning of the death of Capulina, a part of my childhood has now disappeared. It's taken a while to reflect on his passing, but in this case, we cannot have tears, unless they be brought about by laughter. Gaspar Henaine, best known by his stage name 'Capulina', was a figure from my early filmgoing days when I was a child. It is appropriate to tie Capulina with children, because his comedy was built entirely around making children in particular laugh. His humor was always clean: there were never any double entendres, there was never any vulgarity, any tawdry suggestions. Instead, there was always tremendous innocence to Capulina, as if he were a child himself. This isn't to suggest that he was dumb. Rather, Capulina's comedy came from silly situations where he was both the victim and the hero. Inevitably, Capulina would find himself in situations where something was putting him in some form of danger, usually the mildest or most far-fetched type, but in the end, he would always triumph. I remember going to see Capulina films when the Plaza Theater in El Paso would run Mexican films. My mother and grandmother never had to worry that anything in a Capulina film would be either beyond me or would require them to cover my eyes. Everything in a Capulina film, from the story to the performances, had only one intention: to make people, all people, laugh. He could be enjoyed by all ages, and was enjoyed by all ages, because Capulina brought a great sense of fun and innocence to his work. There was never anything mean-spirited about him, either on the screen or off. Everything was all in good, clean fun, operative word: clean. My favorite of his films is Capulina Contra Las Momias (Capulina Vs. 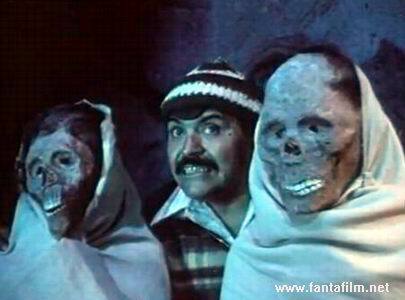 The Mummies). The title itself tells you the whole plot: the cab driver Capulina is trying to get a beautiful tourist to the mummies of Mexico, but in his usual bumbling style, gets lost. In all this, he slips into a dream where said mummies come to life and put our hero and the maiden in danger (I think they were brought back by a mad scientist). I remember the mummies were wearing sheets, so from the start we knew we weren't to take any of this seriously. The film wasn't particularly clever but it was to this child watching, extremely funny. I think this is what makes Capulina such an endearing character: he was never out to harm anyone. There was nothing sophisticated in his comedy, nothing that was remarkably elevated. Instead, Capulina was always just for laughs. How I wish a lot of 'comedic geniuses': a Russell Brand, Aziz Ansari, or Dane Cook, would take a page from Capulina. He didn't have to be vulgar, he didn't have to mean, to make people laugh. All right, he was a bit frenetic, but that added to the laughter. Capulina, unlike a lot of today's comedians, let the situations build the comedy, and moreover, he was always someone we cared about. We can't say we cared about Brand's title character in Arthur or Cook's in Good Luck Chuck. There was always something sleazy, something nasty, something unpleasant, about those characters. That's something we couldn't say about Capulina: he was always a kid at heart, a kind person who was a bumbler but whom we rooted for, and who ended up being on top. It may be cultural, I grant that. However, I would sooner watch Capulina Contra Las Momias than Your Highness if the latter is the height of Danny McBride's 'genius'. The former always makes me laugh, the latter just saddens me. He, I think, understood that good comedy isn't just about funny lines, or even funny situations. You can have raunchy comedies that are hilarious (The 40-Year-Old Virgin, The Hangover, I Love You, Man), but one of the keys to great comedy is to have people care about your character. We did that with those films, and we do that with Capulina's movies. I'll miss him. Capulina always makes me laugh (note the present tense), and perhaps one needs his humor translated. I'm just glad I can follow it.